North Korea's 29 August Hwasong-12 test with Japan fly-over: did it go as planned? It are hectic times for those (like this author) interested in the North Korean rocketry program. The past months have seen a steady series of increasingly bold missile tests (along with a threath of test-firing missiles towards Guam), that have been the subject of three earlier posts on this blog the past months. And now a new one has occurred, and it is perhaps the boldest of these test flights so far. 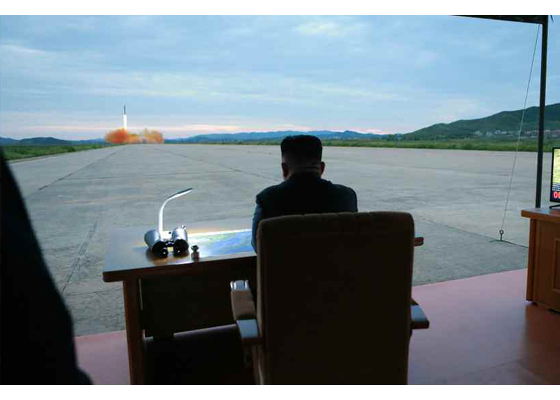 Last Thursday, 29 August 2017, at 20:57 UT, North Korea launched a Hwasong-12 MRBM on a trajectory over Japan: a politically bold move that caused air-raid sirens to go off in Northern Japan. Western military sources say that the missile was fired from Pyongyang Sunan airfield. It reportedly travelled 2700 km, crossing over Hokkaido, coming down in the Pacific Ocean about 1180 km from Cape Erimo in southeast Hokkaido, Japan. 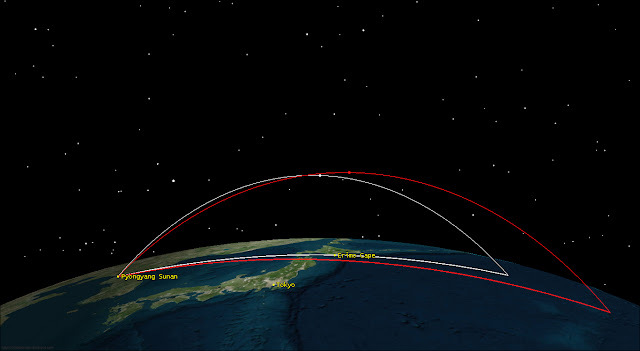 Apogee of the trajectory is quoted as 550 km. This allows us to produce the trajectory reconstruction below (with some leeway as the quoted ranges are probably balpark figures). It shows that the missile crossed Japan over the southern tip of Hokkaido, a trajectory that seems designed to minimize Japanese landmass overflown, mitigating risk levels. The two red circles on the second map are depicting a 2700 km range around Pyongyang Sunan and 1180 km range around Cape Erimo. Where they are closest, is the resulting impact point (near 41.92 N, 157.56 E). Using STK I get a flight-time of ~14 minutes. 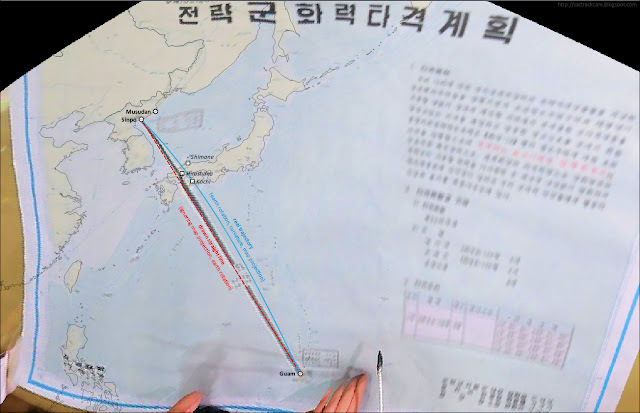 If the sketched line indeed is the intended trajectory, then the interesting point of it is that it does not match the observed trajectory according to Western military sources. It is immediately obvious that the two trajectories do not match well. The trajectory (if it is one) sketched on the Kim Jong Un map is located more to the south, and indicates a larger range, about 3300 km (interestingly, it does conform to a real ballistic trajectory with earth rotation and curvature taken into account, unlike the straight line drawn on the infamous "Guam map"). The difference between the two trajectories amounts to a range difference of 600 km and a 45 km difference in apogee. It represents a difference in launch azimuth of 6 degrees and of 3.7 degrees in launch elevation. It points to an underperformance of around 0.4 km/s in the missile's burnout speed. It is interesting to note that while North Korea for some previous tests (and their proposed Guam shot) published very accurate figures for range, flight time and apogee, they did not do that this time. It is also interesting to note that some Western military sources report that the missile "broke into three pieces". So there are multiple indications that the test did perhaps not go entirely as planned, with an underperformance of the rocket engine and an error in launch direction, and perhaps structural failure. This would imply that the targetting of the Hwasong-12 is not quite fail-safe yet, which has implications for Kim Jong Un's proposed Guam enveloping missile demonstration. 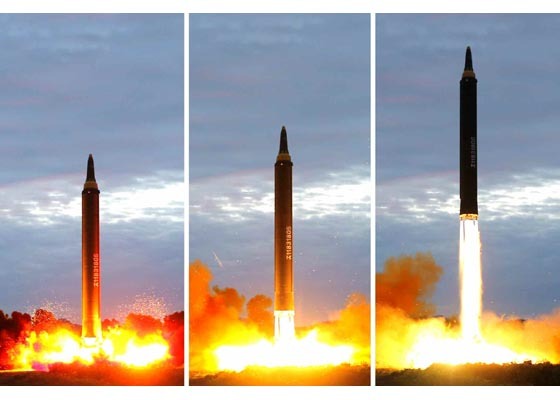 This was the first test of the Hwasong-12 on a "normal" trajectory and it shows why it is important for North Korea to test its missiles on such a normal operational, rather than a 'lofted' trajectory: it is a different regime of stress on the missile and has the engines perform under more realistic conditions than on a 'lofted' trajectory. Errors in targetting and missile performance become more apparent. For North Korea to do such tests on a "normal" trajectory for its MRBM's and ICBM's, they have to fly it over Japan. We are going to see more of this kind of tests the coming months is my prediction. (1) The 38 North blog has an interesting post suggesting the possible failure of a post-boost vehicle. 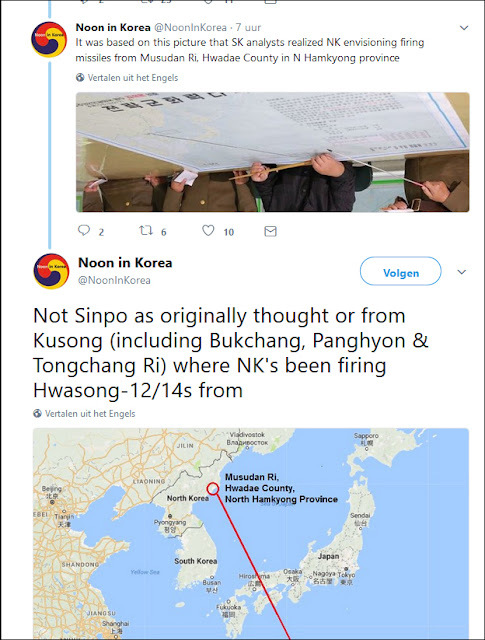 (2) South Korean and US military analysts appear to come to the same analytical conclusions as I did, according to this Korean news bulletin. 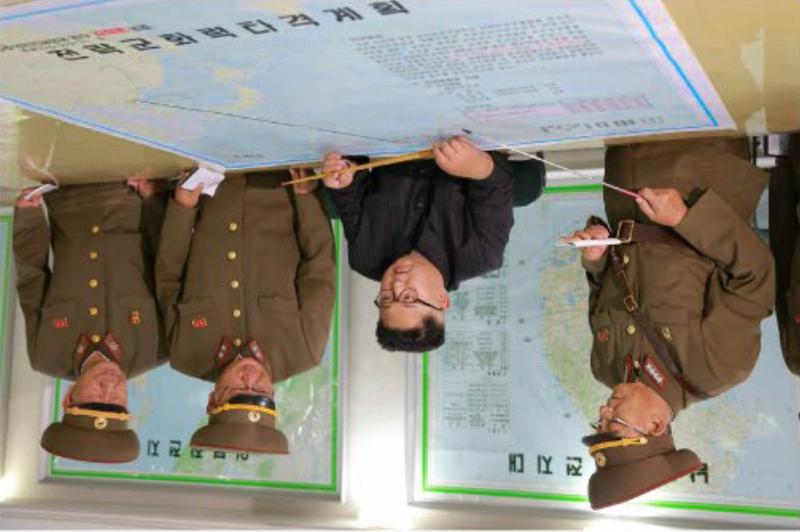 (3) As Ankit Panda rightfully remarked, the situation drawn on Kim Jong Un's map need not comply to reality. It could be merely meant as a propaganda message (3300 km is roughly the distance from the launch site to Guam). A further follow-on post is here, discussing how the map contains two veiled threaths, to Guam and to Pearl Harbour. The sabre rattling between North Korea and the United States is continuing, with increasingly colourful and volatile language and threaths from both sides. In response to Trumps statements on August 8 that North Korea better stop its threaths or else "they will be met with fire and fury like the world has never seen", the North Korean General Kim Rak Gyom, commander of the Strategic Force of the Korean People's Army, released a statement through KCNA on August 10 that included a surprisingly detailed threath about firing four Hwasong-12 missiles towards the US island (and important Pacific Naval and Air Base) of Guam. 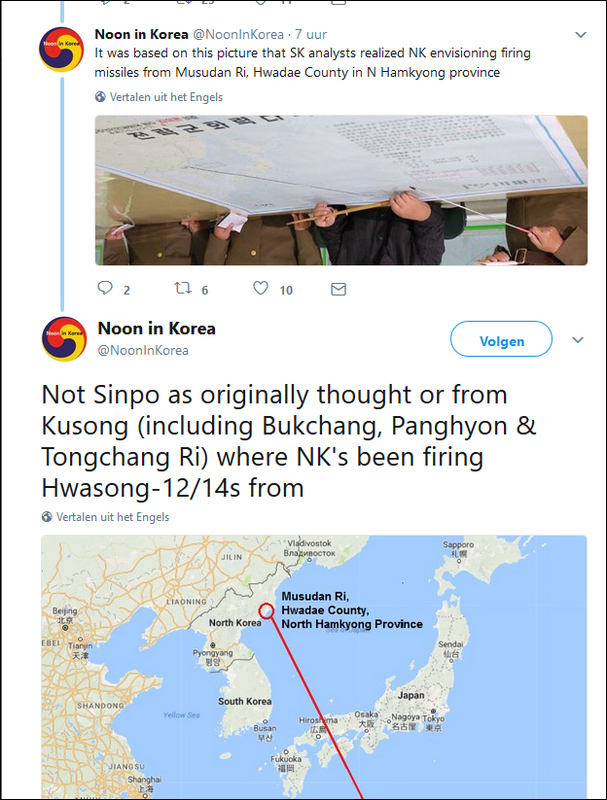 As already clarified, the Strategic Force of the KPA is seriously examining the plan for an enveloping strike at Guam through simultaneous fire of four Hwasong-12 intermediate-range strategic ballistic rockets in order to interdict the enemy forces on major military bases on Guam and to signal a crucial warning to the U.S. The Hwasong-12 rockets to be launched by the KPA will cross the sky above Shimane, Hiroshima and Kochi Prefectures of Japan. They will fly 3 356.7 km for 1 065 seconds and hit the waters 30 to 40 km away from Guam. The details listed, allow to reconstruct the intended launch site for this scenario. 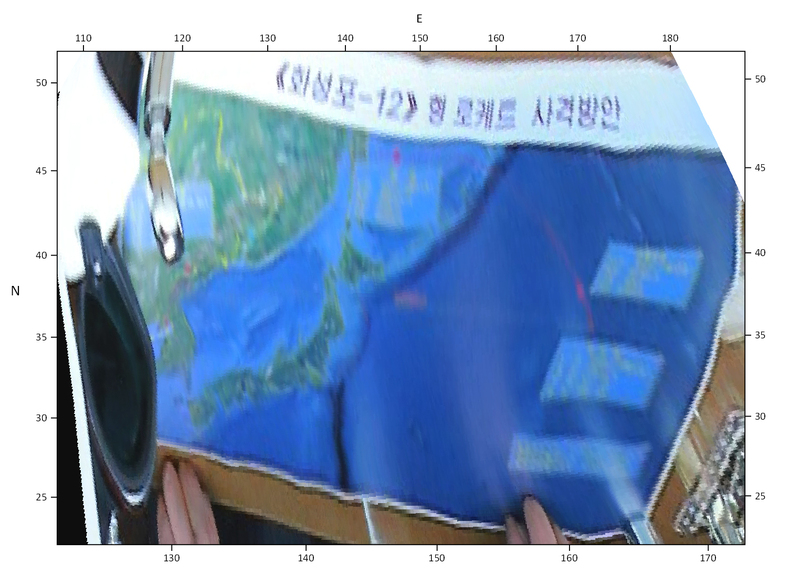 It points to launch of the missiles in the vicinity of Sinpo, an important North Korean Naval Base that is home to its experimental SLBM force and according to satellite imagery analysts has recently seen "high levels of activity" (although that is not necessarily related to the issue under discussion). The distance from the Sinpo submarine SSBA dockyard to Anderson AFB on Guam is ~3357.5 km, in agreement with the distance mentioned in the KCNA statement. 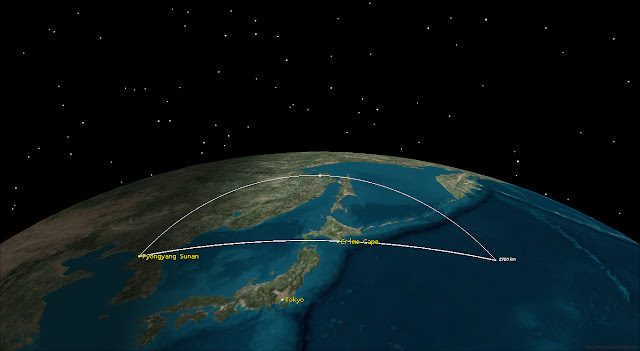 Taking into account Earth rotation, the flight trajectories of the missiles when launched from Sinpo would indeed cross over the three Japanese prefectures mentioned, as can be well seen in the diagram in the top of this post. Together with the listed flight time, it would point to a flight apogee at ~865 km altitude and a launch elevation of ~31.4 degrees, i.e. a "normal" flight trajectory for an IRBM (as opposed to the "lofted", reduced range trajectories of previous tests). The map in the top of this post displays the flight trajectories based on this scenario, with the four missiles straddling Guam at ~40 km distance of its shores, uprange, downrange and lateral to both sides of the main flight direction needed to reach Guam. While the language of the KCNA release is threathening, it is important to realize it is not threathening an actual "attack" on Guam. They talk about a strike that will "envelope" the island with the missiles, each of them impacting at a distance of 30-40 km of the Guam shore. With the listed 30-40 km offshore impact distances, the missiles would land outside of Guam's territorial waters: but in its Exclusive Economical Zone (EEZ). 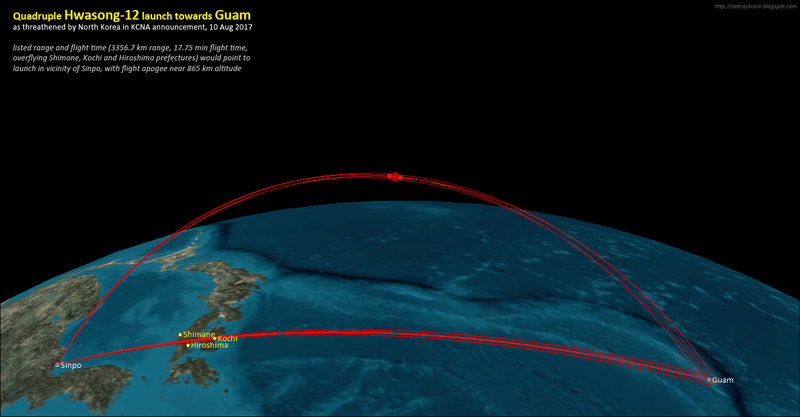 While sensitive, this is something else than actually hitting Guam or the territorial waters directly surrounding it. The latter would be a real attack on US territory. 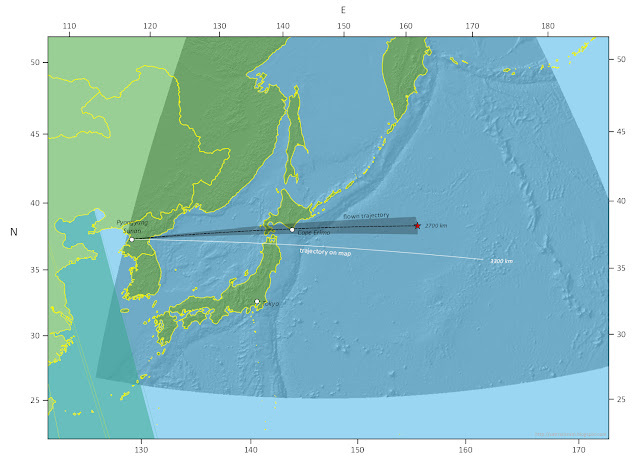 Targetting the EEZ has earlier precedents, as recent North Korean missile tests have landed in the Japanese EEZ. What makes it different this time is that it is the EEZ of the US itself, not of an ally, and involves a fly-over of Japan. Rather than an attack, the scenario painted by the KCNA announcement would be best described as a missile test and demonstration. A test, because it would be the first flight of the Hwasong-12 on a "normal" battle trajectory rather than a "lofted" trajectory. A test, as it would for the first time have the Reentry Vehicle (RV) face the atmospheric reentry conditions it would face if used in an actual conflict. A demonstration, as it would demonstrate that the Hwasong-12 can indeed reach targets at the distance of Guam. A demonstration, as straddling Guam with missile impacts obviously sends a very clear message to the US and its allies. It would also potentially test the Hwasong-12's performance against US missile defense measures. And it would be a (risky) political test to see how the US and its allies would react to such a demonstration of military power. How likely is it that it will happen? On the face of it, not that likely. It most likely is hollow rethoric. Firing missiles towards a US military base and US territory is very risky as it could provoke a disastrous counter-attack. A full scale US counter strike would mean the end of the North Korean regime. However, the oddly detailed August 10 KCNA announcement (which as some analysts on Twitter mentioned almost reads like a NOTAM) could also be seen as a way to mitigate this risk. It clearly signals the intention to not hit Guam itself, just fire near it in a demonstration of power. It is in essence a (tough worded) notice of an upcoming missile demonstration, not an actual war threath. We should also realize that a US counter-attack would be disastrous for both North Korea and the US and its allies. If the US counter-attacks, North Korea will respond by shelling Seoul into oblivion and, if it can, firing missiles towards targets in South Korea, and possibly towards Japan and US bases in the Pacific. The carnage will be incredible. Hence, a military strike on North Korea as a gut-reaction to North Korean missiles landing near Guam is not as likely as it might at first glance seem. A sane US response would be to restrain from such a counter-attack unless there are strong reasons to do so, like missiles actually hitting targets on Guam. North Korea might have made a similar assessment. But it is a risky one (also taking potential missile malfunctions into account). North Korea however has taken bold calculated risks before. They recently fired missiles into the EEZ of Japan, a key US ally. They took a risk in sinking the Cheonan in 2010, and shelling Yeonpyeong island that same year. It is important to note the recent impact of North Korean missiles into the EEZ of Japan, given that the August 10 KCNA announcement points to targetting the EEZ of Guam. This firing into the EEZ of Japan did not lead to military retaliation by the US and allies (and in a sense perhaps might be seen as "testing the waters"). This might embolden North Korea to fire into the EEZ of Guam, expecting (rightfully or not) a similar non-response. What could the US realistically do in response? As mentioned, a counter-attack in response to the missile firings would lead to dramatic results for the US and its allies. Seoul and Tokyo and who knows Honolulu burning seems a steep price to pay for "acting tough" when the missiles provoking the response harmlessly landed in the Pacific Ocean outside of Guam territorial waters. I fail to see how the US can justify such a result to its citizens and allies when the target of the missiles is in the Guam EEZ and not Guam itself. Alternatively, the US or allies could perhaps attempt to intercept the missiles. That sounds like a good middle ground but isn't, as it has its own risks. Intercepting missiles on a trajectory that would not reach Guam territorial waters would provide political fuel to North Korea, who can claim their missile test was attacked. Moreover, there is a serious risk that an intercept attempt partly or wholy fails. That would seriously damage the credibility of the US and its capacity to defend itself and its allies, and with that seriously undermine the faith of US allies in the region (apart from the general loss of face). An attempted missile intercept would therefore be unwise in my opinion, as it would be a win-win situation for North Korea no matter the outcome. So to me, it seems that North Korea is playing a high level (if dangerous) game of chess here, and has managed to checkmate the US. There seems very little the US realistically can do about it, apart from denouncing it. And the tougher the talk from Washington, the more face they will lose if it happens. "Hold my beer", you can hear Kim say in response, knowing he got them cornered. In case North Korea does go forward with the announced missile demonstration, I expect Trump to do what he has done before: back-peddle on his earlier tough talk and grand-standing. And obscure this by making some unrelated outrageous policy decision or statement in order to deflect attention away from this political defeat, just as he has done with earlier political defeats. Maybe the North Korean announcement is just a hollow threath. Maybe it is not. More likely than not it will not happen. But I would not exclude it entirely from happening, if North Korea made a similar assessment as outlined above. We will see. 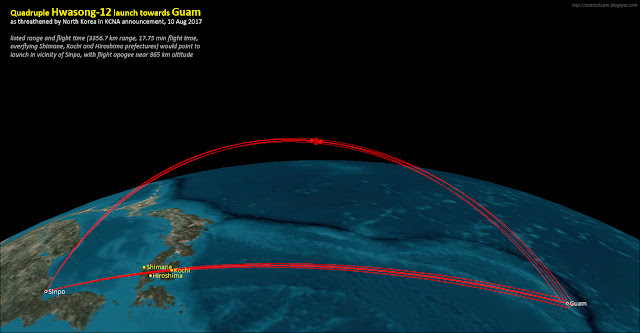 This map clearly depicts a missile trajectory towards Guam, that is very close to the trajectory I presented earlier in this blog post. The point of origin of the trajectory indeed seems to be Sinpo on the southeast coast. What can be seen is that the drawn trajectory points clearly and unequivocally to Sinpo, not Musudan-ri. 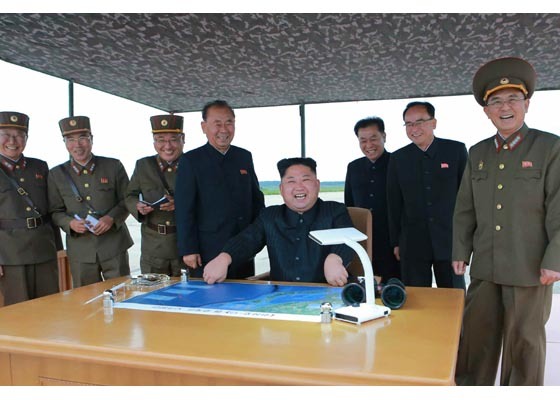 What also can be seen is that the line drawn on Kim Jong Un's map is a simple straight drawn line rather than a real missile trajectory. The blue line I have drawn in the map is a true trajectory, including earth curvature and earth rotation and taking the map projection into account. The dashed red line I have drawn is merely a straight line (ignoring map projection). The country outlines have been added in by me to show how the georeferenced image matches a true map.